-30 here in Vanderhoof. 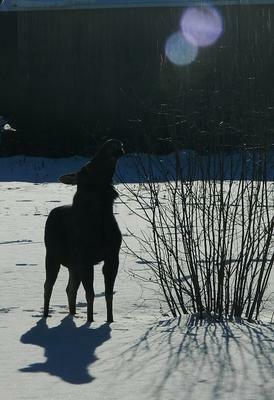 This cow moose has been hanging out on my 5 acre property and I sat on my back steps and shot photos of her eating willows. She continues to be friendly. 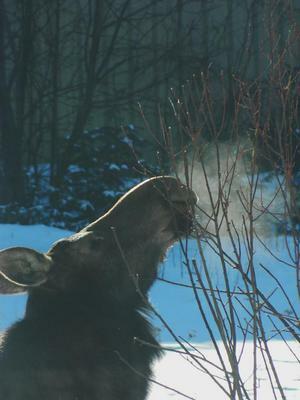 Thanks for sharing your photos of 'your' resident cow moose Barb. At minus 30 degrees Celsius it certainly become a survival of the fittest time of year. Moose are resilient critters and as long as she isn't harassed by dogs or chased down by wolves she should fair the winter well. Snow has a larger unfavorable effect on moose. Moose do not tolerate snow that is greater than chest depth very well. Surprising as it may seem moose and deer find the ease of travel on snow about the same. Moose have a much larger footprint, therefore the amount of weight per square inch a moose foot presses down is about 8.5 to 11.4 pounds per square inch, with North American whitetail and mule deer having near the same. Moose will be supported on snow with a crust capable of holding about 14.2 pounds per square inch (Kelsall and Prescott 1971).